According to viniyoga tradition, our aging process is represented by the movement of the sun throughout the day. Sunrise represents childhood, midday represents adult life, and sunset represents old age. There are specific yoga practices that are appropriate for each stage of life. From the traditional point of view, students in a sunrise stage of life ( teenagers and young adults) need to focus on stronger asana to help develop the growing bodies, teach discipline and encourage the body awareness. Students in a mid-day stage of life (roughly 25-70 years old) need more focus on the breath and other energy management practices to support them in their busy lives that likely include careers, children and households. Students in a sunset stage of life (roughly 70-80 years old and beyond) need to focus on physical maintenance and spiritual introspection to gradually turn away from the external material world and start preparing for the eventual graceful exit. Most of us are in the “householder”, or mid-day, stage of life. We are busy with responsibilities, juggling careers, children, aging parents and all other things that come with adulthood. What we need the most is stability at every level – structural stability to keep the body healthy; physiological immunity to keep us resilient; emotional balance to manage all the challenges that come our way; and financial stability to provide for ourselves and our families. This means that for the majority of us pranayama and other energy management practices are of most importance and asana is secondary. What are you trying to accomplish with this yoga practice? Breath-centered practices work especially well for physiology-related issues and specifically for the three pillars of physiological well-being: energy levels, sleep issues and stress management. Example: To move from frazzled, stressed-out state toward more balance and focus. 2. Pick a breathing technique to do in Pranayama. Choose a breathing technique that would help you manifest your intention and plan to spend some time working with it. Pranayama is usually placed toward the end of the practice, which is related to the traditional idea that asana helps to prepare for pranayama and pranayama helps to prepare for meditation. However, you may choose to place pranayama anywhere within a practice if it helps manifest your intention. Placing your pranayama at the beginning of the practice is less effective since neither the body nor the breath are prepared for it adequately. Unprepared body will distract you and unprepared breath will make it harder to work toward dirgha (long) and sukshmah (subtle), two essential qualities of pranayama. Example: Pratiloma Ujjayi is a best-kept secret in the yoga world. This technique works exceptionally well for lengthening the breath, balancing the system and developing focus. It is usually placed at the end of the practice. 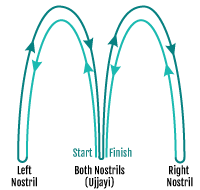 IN – Ujjayi, EX – right nostril, IN – right nostril, EX – Ujjayi. 3. Decide on how you will prepare the body and breath for the chosen technique. BODY: First you need to prepare the lower back, upper back, neck and hips for sitting. Then you need to include some specialized preparation for the technique. Example: For Pratiloma Ujjayi you need to prepare the neck and shoulders for holding the arm while working with the nostrils, intercostals for deeper breathing, and include asymmetrical poses to facilitate right/left brain integration. BREATH: Choose a breath pattern (theme) to carry throughout the practice that will help prepare the breath for the pranayama technique. Example: For Pratiloma Ujjayi you need to lengthen both Inhalation and Exhalation. You can accomplish it by using the following breath theme: gradually deepen both Inhale and Exhale as you move the arm in the pose. Inhale and Exhale for 6 seconds on the first repetition, then 7 seconds on the second repetition and then 8 seconds on the third repetition. Then stay in the pose and maintain the 8-second Inhalation and 8-second Exhalation for 3-4 breaths. 4. Choose asanas to support the breath theme AND prepare the body for sitting in Pranayama. It’s important to choose poses that will be effective, yet they have to be simple and familiar to your students. If you choose complicated and/or unfamiliar asanas, you will have to spend too much time and attention focusing on alignment, which will distract you and your students from the breath. In breath-centered classes, alignment instruction is minimal, just enough to insure student’s safety. Most of the attention is being directed toward the breath. Example: Choosing Utthita Parsvakonasana, Ardha Shalabhasana and Jatthara Parivrtti will help prepare the lower back, upper back and hips for sitting; neck and shoulders for the Pratiloma Ujjayi technique; and intercostals for deeper breathing. They are asymmetrical which helps with right/left brain integration. 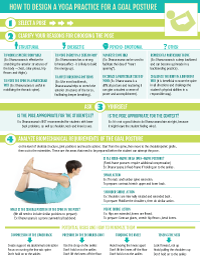 Arrange asanas in order that supports the intention, add compensation and transition poses. Don’t make the practice too long or complex, it will dilute your intention. 6. Interweave your breath theme throughout the practice. A breath theme needs to be simple and consistent. There is no need to work with the breath in every pose, allow free breath in between. Example: Use the breath theme (IN/EX: 6 sec, 7 sec, 8 sec) in these poses. Keep the breath deep and flowing in all other poses. When you do work with breath in poses, make sure that this is where your student’s attention goes. 7. Decide on whether to place pranayama before, after or instead of Savasana. This choice will depend on your intention, your students and the context. Traditionally, pranayama is placed after Savasana and before meditation. But other factors come into play: your students might need to rest after practicing pranayama, or you might not need Savasana if you are doing an energy building practice in the morning, or you might have limited time and will need to prioritize, etc. 8. Check the sequence for logic, compensation, consistency, etc. Review your sequence to make sure that there is enough preparation for the body and breath, that the breath theme is carried throughout, that there isn’t too much focus on the physical details, that the sequence develops from simple toward more complex gradually, etc. Following the steps above will make your practice more integrative and will have a more pronounced effect for your students. Next week we will feature a sample breath-centered practice leading up to Pratiloma Ujjayi. Stay tuned! 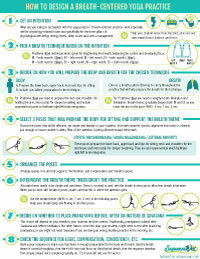 You will also find How to design a yoga practice for a goal posture handout.